We went on an Autumn walk around our school. We saw and found lots of interesting things. In the classroom we explored the things we found. We made pictures using Autumn leaves and hedgehogs with clay. 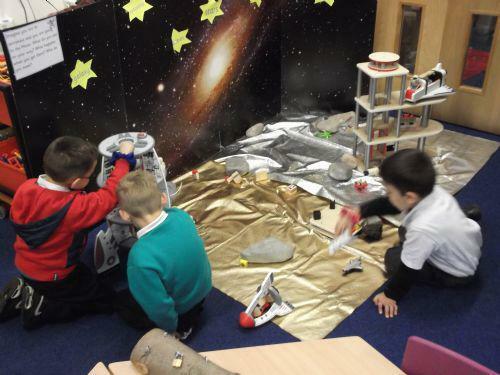 We have created a space station and a hospital in our classroom. We are enjoying taking on the role of doctors, nurses and patients. In the space station we are astronauts flying to outer space and counting down from 10 as our rocket launches. We had great fun making rockets during block play. Don't they look amazing! In our cosy reading corner we have been enjoying looking at the books we borrowed from the library and playing with finger puppets. Here we are making pictures about our topic on space. Look at our amazing space station! We are pretending we are on a journey to the moon. Pudsey visited our school for Children In Need. We raised £236. A big thank you to all our families for giving so generously. For Enterprise Week we made reindeer rice krispy cakes and snowmen popcorn. We made a profit of £30 which will be used to purchase finger puppets and writing materials for the Reception Class. · What are the people called who drive different vehicles? · Why do we need to travel? · How do animals travel? · Why do some animals need to travel far away? We will be listening to many stories based on the topic such as Mr Gumpy's Motor Car, Oi! Get Off Our Train, We're Going on a Bear Hunt. We went on a journey to the local shop. We saw lots of interesting things on the way. We bought some bread and butter at the shop and made some toast when we got back to school. It was delicious! In our fire station role play area we are having great fun pretending to be fire persons, putting out fires and saving people. Look at all the different ways we are making marks with a variety of writing tools. It is great fun and helps us develop our writing skills. We had a visit from Lizzie Daly from CBeebies. Lizzie can be seen on 'The Lets's Go Club' on Saturday mornings at 9.30 am. Lizzie talked about the animals she has seen and taught us her dance! Click HERE to find out more about Lizzie. In the outdoor learning area we created an imaginary train and played the parts of the different animals from the story ‘Oi! Get Off Our Train.’ It had great fun re-telling the story. We have been experimenting how to make a car travel faster and further. We recognised the need for a slope and a big push! We have been looking at what the word 'technology' means. We went on a technology treasure hunt around the school. We found many types of technology that we use every day. We read the book 'Mr Gumpy's Outing.' We decided that we wanted to find out which materials floated and which materials sank. To investigate we used a water tray and a variety of materials. We then wanted to find out which materials made the best boat for the animals. We found out that plastic was the best material for making our boats. Charlotte from Up Beat Music is teaching us how to keep a beat. We are having such a good time singing and using percussion instruments. We have been learning to recognise and describe 2D shapes. We went outside to find 2D shapes in the environment. We found lots of different shapes. We played with 2D floor shapes to explore and create tessellating patterns. Using Purple Mash we created Autumn pictures on the computer which we saved and printed. Don't they look amazing? We are very lucky that Rumney Hub is next to our school. One morning we walked to the Hub to choose a book each from the library. The books we chose are in our book corner for us all to share.